Designing and printing envelopes can be both fun and complicated at the same time. You need to carefully estimate the envelope’s specifications so the envelopes would come back to you looking the way you want them to. If you’d like to make designing envelopes easier, you would need a file setup template. File setup templates from titheenvelope are absolutely free of charge. • Using envelope templates help prevent printing defective copies because the template contains bleed lines and margins for you to follow. • With the envelope setup template, making an envelope design or artwork is faster because you don’t have to estimate cut lines anymore, you can already see them. 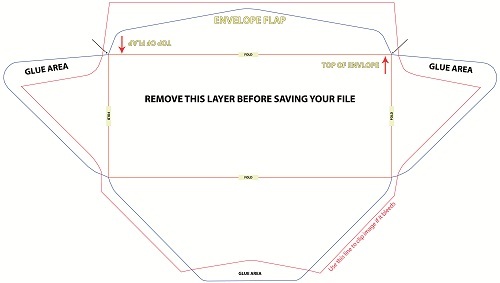 • If you’re going to mail your envelopes, there is also an envelope template that has guidelines for you to follow to make sure your envelope complies with USPS standards. We at titheenvelope provide quality service as much as we can. That is why we continue to find ways on how to make your envelope printing experience easier and a more pleasant one. For more information on envelope templates and other services we offer, please call us at 1-800-377-6155 or chat with our friendly representatives via live chat system.